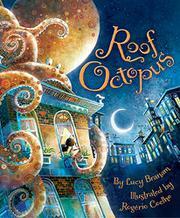 What could be more delightful than a huge and friendly octopus on the roof? That at least is the premise of Branam’s debut—which Coelho (Boat of Dreams, 2017) illuminates with views, usually canted or vertiginously angled, of a smiling, golden cephalopod hanging colorfully spotted tentacles down the sides of a city apartment building. Young Nora (brown-skinned like her parents and some of her neighbors and friends) is certainly wonderstruck when it taps on her bedroom window. Although the initial reactions of the grown-ups are a bit mixed (“they all went on to work and school and tried not to make eye-contact with it”), the way it lifts residents to their apartments, helps with small chores, and swings children back and forth soon wins everyone over. Her father’s wonderful if seemingly witless suggestion that the genial giant might be making a migratory rest stop actually gains credence when it disappears after Nora murmurs something about bringing it to show-and-tell at school. But that Friday there’s a tap…on her classroom window. Coelho’s illustrations have the geometric look of Lane Smith’s, higgledy-piggledy angles lending great energy to the proceedings.